Nominated for 2 New York Innovative Theatre Awards! Armed with an acoustic guitar, actor-playwright J.Stephen Brantley reveals how he got from junkie to functional with a little help from the queen of reinvention. Chicken-Fried Ciccone is one man’s journey to heroin and back, set to countrified covers of new and classic Madge. Obie-winning master of the one man show David Drake directs. 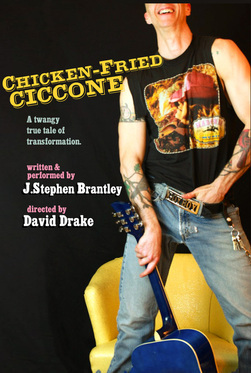 New York Innovative Theatre Award nominee, Indie Theatre Now Person Of The Year, and former homeless heroin addict J.Stephen Brantley puts a country spin on Madonna’s oeuvre in this autobiographical quasi-cabaret about addiction and recovery.